Olympic athlete Helen Maroulis made history this August as she won the first-ever Olympic gold medal in women’s wrestling for the Americans. This was a historic event, as she finally put the United States on the map for this sport by beating the 13-time world champion Saori Yoshida of Japan. Maroulis and her coach worked hard to study videos and strategies to earn the win, and despite all of the respect that Maroulis has for Yoshida, it was a very celebrated victory. The Rockville, Maryland native started wrestling in her teenage years and went on to join the Missouri Baptist University women’s wrestling time. Later on, she signed up with the U.S. Olympic Education Center at Northern Michigan University to prepare for the summer games, which she went to and came out victorious in her battle. Her coach Valentin Kalika helped her train for the 2016 Rio games, and the two of them came out on top this year. Maroulis recently made history at the Olympic games as the first-ever athlete from the USA to come home with a gold medal from women’s wrestling. 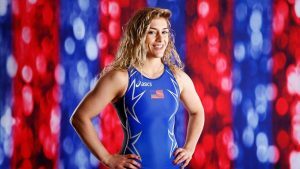 If your company is interested in finding out availability and booking fees for an Olympian like Helen Maroulis or other sports celebrities for a Personal Appearance, Autograph Signing, Product Promotion, or Sports Camp, call us at 1-888-246-7141.